Superintendent Joy Hofmeister at an Oklahoma Watch-Out forum in 2015. State Superintendent Joy Hofmeister was charged Thursday with felony conspiracy and campaign violations in Oklahoma County District Court stemming from activities during the 2014 superintendent race. 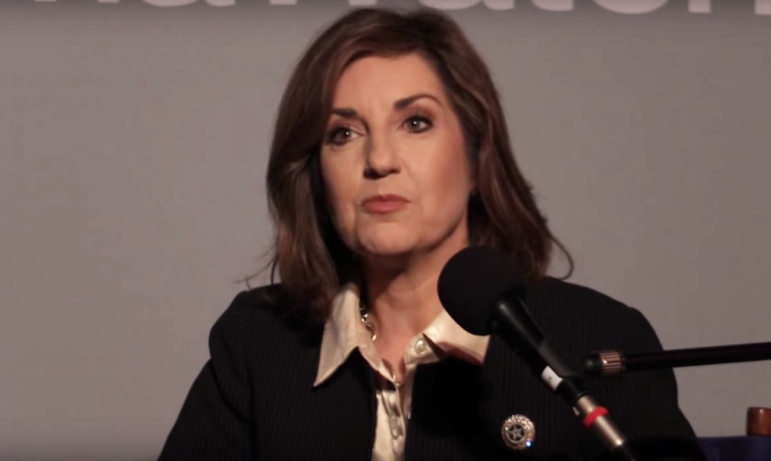 The charges accuse Hofmeister, who was elected in 2014, and four others of funneling $100,000 in donations from American Fidelity Assurance Co. and $200,000 from two education organizations to a group named Oklahomans for Public School Excellence, a 501(c)(4) “social welfare” nonprofit, to exceed campaign contribution limits. While Hofmeister’s official 2014 campaign committee, Friends of Joy Hofmeister, was bound by campaign donation limits, no such donation limitations exist for groups like Oklahomans for Public School Excellence, which are often referred to as “dark money” groups. Though dark money groups may raise and spend unlimited sums of money, they are prohibited from coordinating their activities with the campaigns of those who benefit from those groups’ work. The charges filed Thursday accuse the Hofmeister campaign of doing that. At a press conference Thursday afternoon, Hofmeister denied engaging in any illegal activities. “I will vigorously defend my integrity and reputation against any suggestion of wrongdoing,” Hofmeister said. “And I will fight these allegations that have been made against me. “I will fight against these charges but I will not be distracted,” she added. “The state of Oklahoma, our parents, our children, deserve my continued focus, and they will have it. Along with Hofmeister, four others were also charged with felony conspiracy and violating the Computer Crimes Act: campaign consultant Stephanie Milligan; Steven Crawford, former executive director of Cooperative Council for Oklahoma School Administration; Lela Odom, former executive director of Oklahoma Education Association; and Robert “Fount” Holland, founder of the political consulting group A.H. Strategies. In the 2014 Republican primary, Hofmeister defeated incumbent Janet Barresi, who had become unpopular among many teachers, administrators and others in the education community. According to an affidavit filed in the case, American Fidelity wrote checks to both the Oklahoma Education Association and Cooperative Council for Oklahoma School Administration for $50,000 each. The educator groups each added $100,000 of their own funds and donated the entire amount to Oklahomans for Public School Excellence, the affidavit says. The funds were used to finance ads opposing Barresi. Hofmeister announced her candidacy in January 2014, but excerpts of emails in the affidavit show Hofmeister was planning to run for the post as early as April 2013. That month, Hofmeister emailed Jenks Public Schools Superindentent Kirby Lehman stating that she had met with Glenn Coffee, former secretary of state turned political consultant. Hofmeister wrote that Coffee had recommended using political consultant Chad Alexander to run an independent campaign on Hofmeister’s behalf, and the independent campaign group would be where money from the Cooperative Council for Oklahoma School Administration, the Oklahoma State School Boards Association and the Oklahoma Education Association, as well as corporate funds, would go “as it would all be anonymous,” the affidavit quotes Hofmeister as stating in her email. Ultimately, OSSBA was unable to donate, the affidavit says. Hofmeister, Milligan, Alexander, Odom, Crawford and CCOSA General Counsel Ryan Owens all worked together to form Oklahomans for Public School Excellence, the affidavit states. Several of them also coordinated with Holland, whose consulting firm was running Hofmeister’s official campaign, and others involved in the campaign committee to formulate a combined campaign strategy, the affidavit alleges. The affidavit shows that prosecutors built their case in part on text messages recovered from the cell phone of Alexander, who was arrested in May 2014 after buying cocaine from a drug trafficker. Under a plea deal, he pleaded guilty in October that year to drug possession charges and was placed on five years probation. He is listed as one of the witnesses in the case. A number of text messages quoted in the document involve exchanges showing that Holland, running Hofmeister’s campaign; Hofmeister and others made references to use or formation of the independent expenditure group. The evidence shows, the affidavit states, that Hofmeister’s official campaign illegally coordinated with Oklahomans for Public School Excellence, resulting in the expenditures by the dark money group being in-kind contributions from corporations, and thus exceeding campaign donation limits for Hofmeister’s campaign. Investigators interviewed Hofmeister, with her attorneys present, on June 17. Hofmeister stated that she had no specific knowledge of the independent expenditures, the affidavit states. When asked to explain her statements in the emails, in one of which she uses the phrase “my IE” with a smiling emoticon, one of her attorneys halted the interview. An independent expenditure group that paid for television ads opposing State Superintendent Janet Barresi in last month’s primary has not filed required spending reports with the Oklahoma Ethics Commission. Little is known about the group, but an Oklahoma Watch investigation reveals who is running it.